I’ve never seen WELCOME BACK, KOTTER, but as a teacher currently working at his former high school, I may well appreciate some of its content. But for me, it has always blended into the morass of TV shows that I have never seen live or in reruns due to my extremely limited exposure to television programming over the course of my youth. I have not been privy to the enculturating joys of SILVER SPOONS, THE WONDER YEARS, THE LOVE BOAT, HAPPY DAYS, or anything starring Scott Baio. Jimmy Baio, yes; Scott, no. Regardless, aside from the fervored testimonials about the show from characters on FREAKS AND GEEKS, KOTTER was not a name to conjure with in my book. 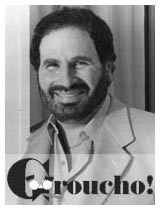 So the news that a local production of Arthur Marx‘s play GROUCHO was to star Mr. Kotter himself left me with no attendant feelings of awe and with no stars in my eyes. The fact that the script had been penned by Groucho’s son did pique my interest, though, and a fortnight into the run of the play, I wandered down to the Stoneham Theatre and plonked down a pretty penny for a fifth-row seat. Kaplan immediately got my respect for addressing the basic difficulties of the performance: he doesn’t much look like Groucho. “He’s too tall,” Kaplan said about himself, beginning the play daringly out of character. “His face is too round, his nose is too big, his nose isn’t big enough…” I laughed, as the round face was what had first struck me. I was impressed that he was able to anticipate our varied responses so accurately. It turns out that Kaplan has been playing the part for some time, and a stage performance of the part was filmed for video back in 1982. He’s had a lot of time to work through quirks of the production, and with the one essential difficulty that he has a moustache and yet has to wear Groucho’s patented greasepaint moustache at one point, the technical aspects of the show were almost flawless. With a notable and wonderful exception: archival photographs from the Marx Brothers’ lives were projected on a screen throughout the play, and at one point a slide failed to appear. Kaplan effortless ad libbed and continued gamely. At other points, he departed from the script to poke fun at a fellow actor with a case of the giggles and to respond to the moments that made themselves available. Most impressive, though, was Kaplan’s transformation from old Groucho to ancient Groucho. His vocal mannerisms and body language were so fragile, with the meticulous breathlessness of the dying. His glacial interplay with the young reporter that comes to visit him in his last years was amongst the funniest portions of the script because of Groucho’s dogged desire to make all of the jokes that he came up with in response to a situation, even if he could no longer crack them out rapid-fire. The timing was wonderfully funny and dry, even if it was the complete opposite of the style that had made him famous in his heyday. 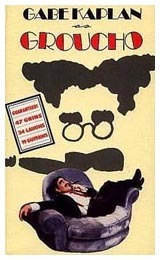 I have no idea if the timing was Kaplan’s or based on actual accounts and footage of Groucho in his end days. Regardless, it was convincing and real to a hilarious and heart-wrenching degree. Lastly, let me say that while my first reaction to Mr. Kaplan was the response that he anticipated, the final moment of the play was him standing onstage with a large picture of Groucho in last years. And the resemblance was spot on. Kaplan may not have resembled Groucho in his film days, but the play was about his end days, and the visual parallels were uncanny. I sat there and had to eat my previous agreement: it worked.